An excellent knowledge of root canal anatomy of teeth is a golden standard for the successful clinical outcome of root canal therapy. Several anatomic variations may occur in a permanent mandibular first molar. Usually, three to four root canals are found, but six to eight canals have been reported. A 22-year-old Bangladeshi woman was referred for endodontic treatment of mandibular right first molar. Rigorous clinical examination revealed the presence of three canals in mesial root and three canals in distal root as well. The dentists should expect any variation in root canal system and use the diagnostic tools to manage the cases. The golden standard of root canal treatment (RCT) is a successfully completed obturation of inert filling materials“Gutta-percha” after careful cleaning and shaping of the pulp space. Failure to do that is leading to no healing and complications;, thus, the clinicians should have a good understanding of the root canal anatomy and its variations to improve the predictability of root canal therapy. The mandibular first molars usually have two roots (mesial and distal) that accommodate two mesial canals and 1–2 distal canals, respectively. Rarely, there is extra canal called the middle mesial (MM) canal, found in the mesial root. This canal is existing in the developmental groove, which situated between the mesiolingual (ML) and mesiobuccal (MB) canals. The incidence of a MM canal was ranged 0% to 37.5%. In addition, middle distal (MD) canal may present between distolingual (DL) and distobuccal (DB) canals. 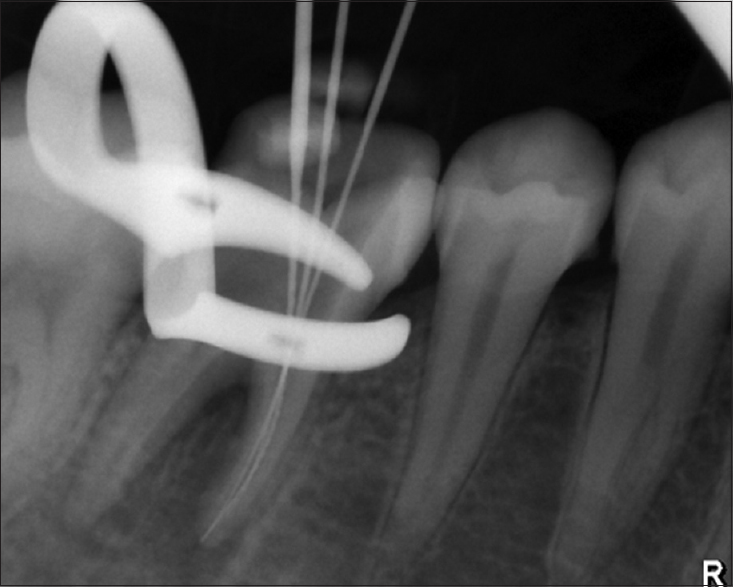 Three canals located in the distal root is infrequently, and their incidence is up to 8%. 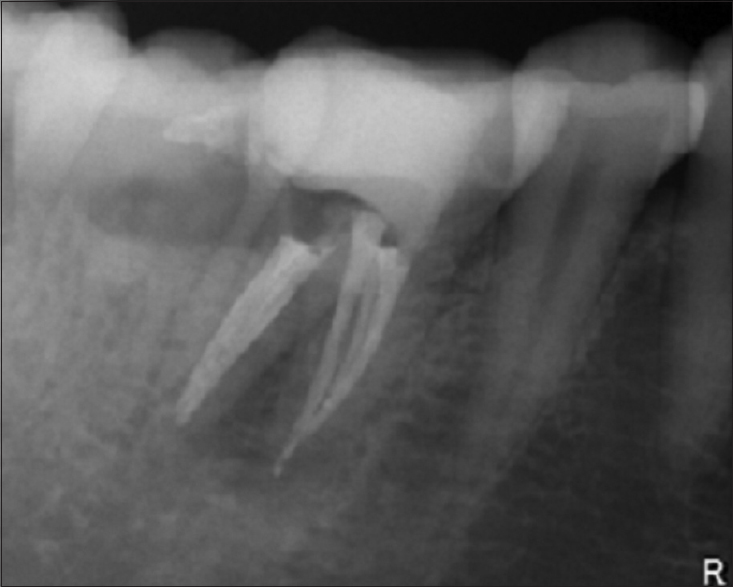 Commonly these canals join nearby canals, after obturation the tooth appears to be fewer canals present. Rarely all canals have a separate pathway and foramen. A 22-year-old Bangladeshi woman with good general health presented for nonsurgical endodontic treatment of mandibular right first molar (#46). The patient was referred to the Endodontic Department at Riyadh Colleges of Dentistry and Pharmacy in Namuthajiyah Campus, Riyadh, Saudi Arabia. The chief complaint was to complete the previous treatment. Radiographs were carried out with no periradicular radiolucency [Figure 1]. The tooth was not tender to percussion or palpation. After clinical and radiographic examinations, the tooth was diagnosed as having previously initiated therapy and asymptomatic apical periodontitis. Local anesthesia with epinephrine was introduced through inferior alveolar and lingual nerves, and then the rubber dam was placed for isolation. After removal of temporary filling and caries with large low speed round bur, the pulpal floor was carefully examined with magnification loupe ×4 (EyeZoom™, Orascoptic, USA). The MB, ML, DB and DL canal orifices were identified. Furthermore, the developmental groove between the ML and MB canals that indicated the presence of MM canal, which was identified and negotiated to full length with #8 and #10 K-hand file. MD canal was observed between DB and DL canals where, the MM canal was joined with MB and the MD canal joined with DL [Figure 2]. Working length was determined by Electronic Apex Locator (Root ZX II J. Morita, Tokyo, Japan) and then confirmed by periapical radiographs [Figure 3] and [Figure 4]. Instrumentation was carried out by using ProFile.04 Files Rotary System (Dentsply, Maillefer, Ballaigues, Switzerland) until reached File #35. Copious irrigation with 2.5% sodium hypochlorite and 17% ethylenediaminetetraacetic acid was achieved during the instrumentation phase. Paper points dried root canals, and then obturation was achieved by matching Gutta-percha cones and AH-Plus Sealer (Dentsply Maillefer, Ballaigues, Switzerland). The access cavity was sealed with the temporary filling material (Coltsol ® F, Coltene, Switzerland) and the patient was referred for final restoration [Figure 5]. The main aim of endodontic therapy is to maintain the tooth function without pain, through the disinfection and obturation of the root canal system. The inability to good understand the root canal anatomy and the inability to locate all the root canals for subsequent disinfection and obturation may lead to failure and periapical diseases. Ryan et al. reported mandibular first molar with 6 canals, 3 mesial, and 3 distal canals, where all distal canals exit in one apical foramen. A similar finding was observed in the currently reported case. In fact, the incidence of MM canals in mandibular molars are high (46.2%) and it is detected more in young patients. The age of the patient of this reported case is 22 years which confirmed the finding of Azim et al. According to Martinez-Berna and Badanelli, the presence of three canals in the mesial and distal root of the mandibular first molar was possibly due to compression of the connective pulp tissue as a result accumulation of secondary dentin during the growth of the root that form a vertical walls. 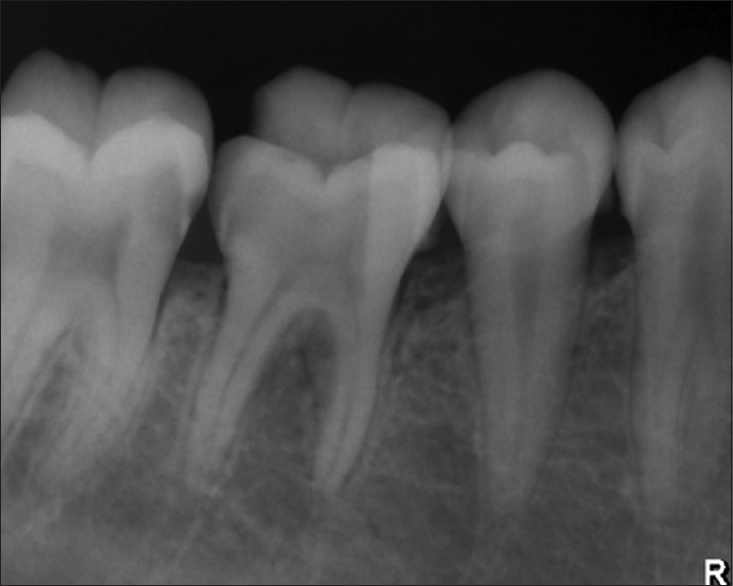 Law of concentricity and“law of Symmetry” are important to keep in mind during access cavity achievement to identify all root canals and prevent the endodontic treatment failure. Different angles (more than one angle) must be achieved during taking radiographs is very important to detect any morphological variations., If conventional radiographic techniques provide limited information, and more details are needed, advanced radiographic tools like cone-beam computed tomography (CBCT) are very helpful to diagnose morphological variations. Also, use of magnification tools such as magnification loupe or dental operating microscope (DOM) may help to locate the canal orifice of additional root canals. Magnifying loupes were used in the present case. It helps to detect extra canals. When compared with magnifying loupes, the microscope was either comparable  or superior. Unfortunately, some endodontists that are using the DOM in their practice are not using it as often as they anticipated. Clinical and radiographic examinations to detect any anatomic variations are very important. 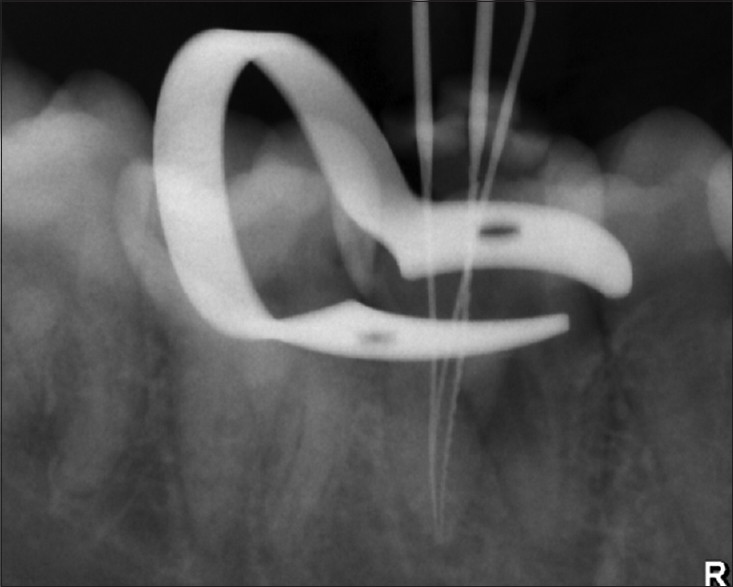 Using magnifications, advanced diagnostic tools like CBCT, and tactile search techniques to locate extra canals should be done routinely to improve the outcome of the RCT. The reported data of this case may help clinicians understand the anatomical variations in the root canal morphology of mandibular first molars. Vertucci FJ. Root canal morphology and its relationship to endodontic procedures. Endod Top 2005;10:3-29. Cantatore G, Berutti E, Castellucci A. Missed anatomy: Frequency and clinical impact. Endod Top 2006;15:3-31. Friedman S. Prognosis of initial endodontic therapy. Endod Top 2002;2:59-88. Vertucci FJ, Haddix JE, Britto L. Tooth morphology and access cavity preparation. Pathw Pulp 2006;9:148-232. Skidmore AE, Bjorndal AM. Root canal morphology of the human mandibular first molar. Oral Surg Oral Med Oral Pathol 1971;32:778-84. Azim AA, Deutsch AS, Solomon CS. Prevalence of middle mesial canals in mandibular molars after guided troughing under high magnification: Anin vivo investigation. J Endod 2015;41:164-8. Filpo-Perez C, Bramante CM, Villas-Boas MH, Húngaro Duarte MA, Versiani MA, Ordinola-Zapata R. Micro-computed tomographic analysis of the root canal morphology of the distal root of mandibular first molar. J Endod 2015;41:231-6. Wolcott J, Ishley D, Kennedy W, Johnson S, Minnich S, Meyers J. A 5 yr clinical investigation of second mesiobuccal canals in endodontically treated and retreated maxillary molars. J Endod 2005;31:262-4.
al-Nazhan S. Incidence of four canals in root-canal-treated mandibular first molars in a Saudi Arabian sub-population. Int Endod J 1999;32:49-52.
de Pablo OV, Estevez R, Péix Sánchez M, Heilborn C, Cohenca N. Root anatomy and canal configuration of the permanent mandibular first molar: A systematic review. J Endod 2010;36:1919-31. Martinez-Bern A, Badanelli P. Clinical investigation of lower molars with five root canals. Bol Inf Dent 1983;10:27-41. Krasner P, Rankow HJ. Anatomy of the pulp-chamber floor. J Endod 2004;30:5-16. Buhrley LJ, Barrows MJ, BeGole EA, Wenckus CS. 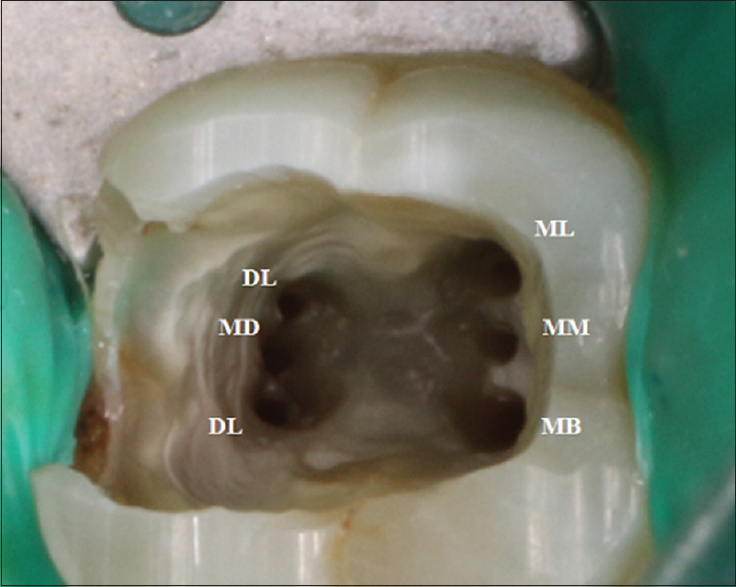 Effect of magnification on locating the MB2 canal in maxillary molars. J Endod 2002;28:324-7. Schwarze T, Baethge C, Stecher T, Geurtsen W. Identification of second canals in the mesiobuccal root of maxillary first and second molars using magnifying loupes or an operating microscope. Aust Endod J 2002;28:57-60. Alrejaie M, Ibrahim NM, Malur MH, Al-Fouzan K. The use of dental operating microscopes by endodontists in the Middle East: A report based on a questionnaire. Saudi Endod J 2015;5:134-7.